When a new startup business is formed, the founders are usually responsible for the product as well as the business functions. Its their vision. They are convinced that the world can and should look a certain way and they are compelled to make it so. This involves both understanding the need and defining the product or service that will satisfy that need. It also extends to how how a business can be formed and grown around that product / market fit. Because of the early fusing of product and business, the early stages have both of these functions directly working with the other key business function - development. The people driving the business and the product are in high contact and directly aligned with the people building the product and delivering the outcome. Then as the business grows the functions start to separate out. The top business functions get less and less high-touch contact with the development of the products. At this point, the founders usually focus on the business side of things such as strategy. They increasingly become sources of decisions rather than information. As the triangles move apart, additional layers of processes and people are added to cover this loss. One of the key layers is product management. 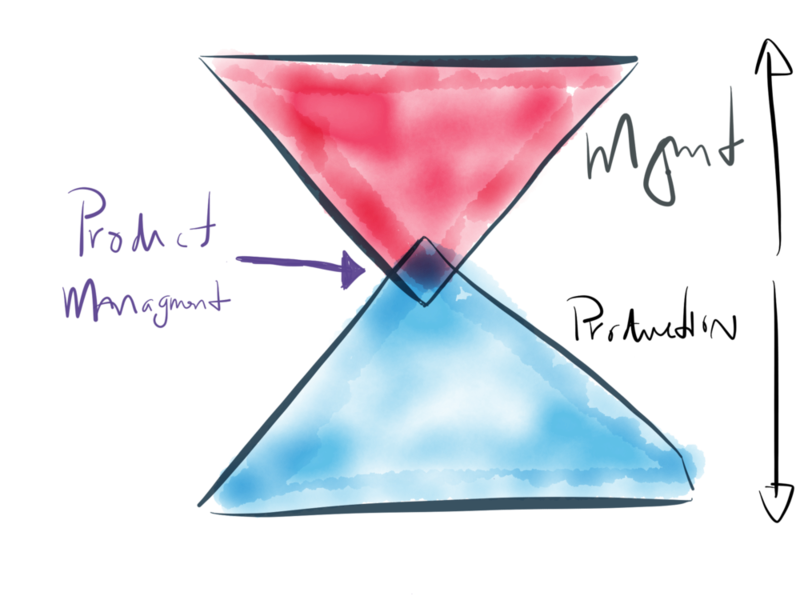 Product Managers become the connection between the two triangles. This is why its a tough job. They are the tip of each iceberg with most key people still feeling the pain of separation. Many product managers have and will continue to fail to live up to such expectations. Certainly many businesses do not recognise the degree to which they are exposed with such a structure. In particular how the business strategy and product strategy are not as aligned as they should be with delivery. It is interesting that the majority of thought leadership on how to fix this is coming from the product and development disciplines rather than from the business side of the equation. It is certainly the more engineering and product led companies in tech that are driving towards integrating "product thinking” across the business. Is this how we would purposefully engineer a business? Or is it just how it ends up working out through the natural growth described above? The internet and convergence are driving many positive changes, but suppressing people’s fragile ego isn’t one of them. 1. The internet has brought great value as a democratiser of information and a debatable flattening of associated social advantage. People anywhere in the world can produce words and images and publish them on their own or associated with anybody else’s content, regardless of who they are. People can all walk down the street and talk to each other as well, regardless of social rank. However, this hasn’t satisfied humans. We’ve created places, products and services that only people ‘like us’ can go and use so we avoid such mixing. 2. Our cities are full of exclusivity. They are dripping in the nuance of economic class and all its signifiers (clothes, body shape, accent, volume) and many places and much business is based on excluding one group of people from another. This is not a top / down phenomenon. Though the "velvet rope" is useful shorthand, there are as many places with an equal and opposing exclusivity to anyone wearing pinstripes or pearls. The velvet rope is alive and well in the physical world so why not our parallel digital existence? 3. On the internet, the primary business model we’ve managed to come up with is mass display advertising. Eyeballs are what matter. They are the primary metric against which all is judged. This has had significant impacts on products and services where distribution was the limiting factor and cost (i.e. news media). When eyeballs are the primary score, having a velvet rope keeping some people out isn’t a very good business tactic. On the street, its a valid business model to have something that is exclusive with high barrier to entry for only a small subset of the population. Many places, products and services maintain their high value primarily due to manufactured exclusivity. 4. Of course the accumulation of eyeballs and connections is in itself a social dissector, Klout for example, engineered to be so to feed to top line metrics of more people from more target groups to sell to advertisers. It is admirable how, do date, digital people have viewed attempts for exclusivity as unseemly. Also the general backlash against Klout's attempts at spotlighting social classes based on noisiness (truly a parable of our age). For many commentators, they are sharp enough to see this as the thin edge of the wedge. For others they look like they don’t want their position of top of the digital heap to be eroded by all the assholes with money and looks yet again. 5. So how will exclusivity be recreated online? True exclusivity where it explicitly exists to ensure vast groups of people cannot participate. Either people will have to start paying real money for such exclusivity, rather than paying in social sharing, or advertisers are going to have to see real advantages (revenues and brand value) from talking to only those people and those people only. Or other business models will arise to bring this most base human impulses. It seems hard to believe that people have simply decided that they are all happy to play together in the same sandbox online, while never entertain the idea of a similar coming together in the cities they live in. Perhaps this was tolerable when digital was something separate, only accessed from a desktop in text and non-realtime imagery. However, in the converged environment we all live in, there is no practical separation. How many places do people not share on Foursquare because they don’t actually want other people there? Social bragging of where you are somewhere quickly erodes the value of the visit. Sharing something cool, precipitates its uncooling. Truly a modern dilemma. Nice piece by Red Associates (@ReD_Associates) on how premium and digital struggle to co-exist: The Value of Digital Wear & Tear. There is a lot of in-depth analysis and discussion about how Apple is going to deal with a perceived saturation of the expensive, high-end of the market (i.e. $600+), most intelligently by Benedict Evans (as usual). This has fed the speculation, and rumour-expectation, of a low cost iPhone this Dec quarter with a greater targeting of Asian customers. (again, see Benedict's blog). At the same time, Apple is taking some heat for its "This is it. This is what matters." ad spot. The criticism highlights the prominence of experiencing a product, rather than the product enabling an experience for the people. Once you start to see it, it is indeed hard to miss. I think its fairly clear that the two issues are tightly aligned. Apple's goal is to move beyond high (or medium or low) markets. It is to make their products completely necessary - the most important thing you can own. To make the iPhone and iPad so essential, such a natural companion during any human interaction that the price doesn't matter for people. They will pay for it at the expense of everything else. The sole objective is for the product to rise up everyone's priority list. And I think its going to work. When people talk about mobile disruption, everything going mobile, etc., this is what it really means. Your mobile is the most important thing in your life. Without it, you have no life. Great idea template from friends at Brainmates. Been thinking a lot lately about how the atomising effect of digital on content, only now being understood and addressed by media companies, is spreading towards deeper functional components. Benedict Evans has a great post exploring this: Twitter, canvases and cards. The insights Google gathers from #ifihadglass submissions can help shape product development, app development, and product marketing. For example, if you read the #ifihadglass tweets, you see that most of the submissions relate to sharing a point of view literally from someone’s own eyes, whether that’s for charity or sport or shopping. That’s what’s getting people really excited — Glass is tapping into a deep human need to be understood and share experiences with other people. A smaller number of posts relate to augmented reality — having data overlaid on physical space, whether that’s for entertainment or navigation or fixing something. Google product strategists and marketers don’t have to guess what excites people about their product — they already know. Ultimately, the day of the overshare may have passed, and bragging online isn't as fun as it used to be. The really interesting questions is how FB is used and viewed outside the US/EU where a channel for personal expression is not a given. Maybe FB starts to become focused on these societies?